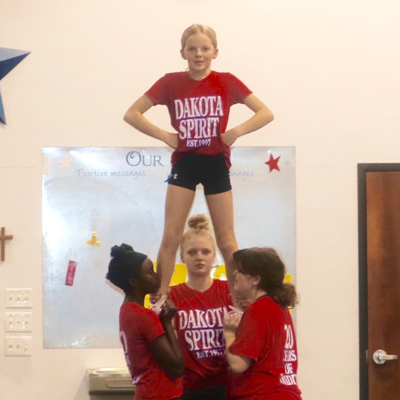 Dakota Spirit teams and classes promote spiritual, physical and mental development while building self-confidence, good character, and commitment in youth. The lessons learned at Dakota Spirit will make winners for life! Why Dakota Spirit? 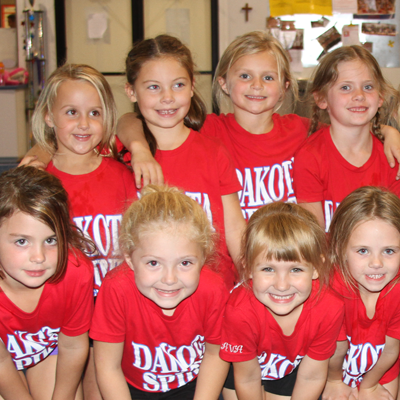 Dakota Spirit was the first youth cheerleading program in South Dakota and remains to be a top program in the Midwest. 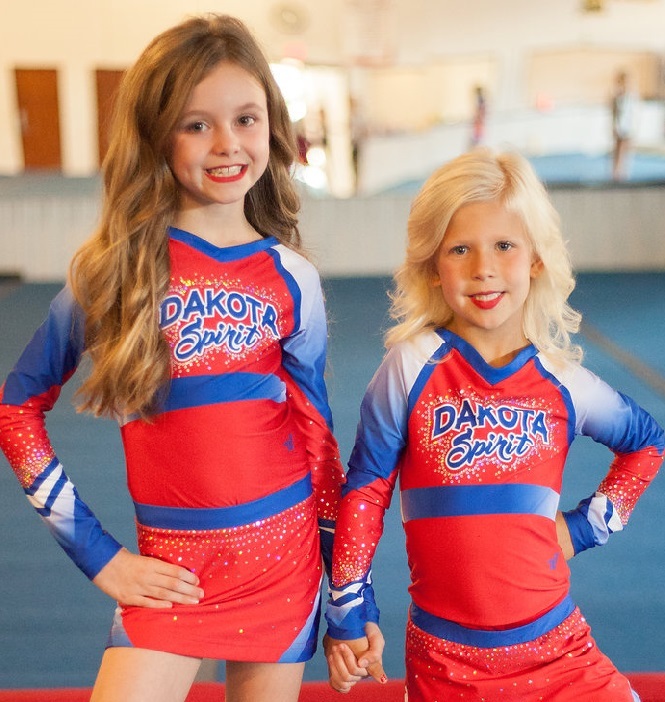 Whether your child is looking for recreational fun in tumbling and cheerleading or the intensity of competing, there is a place for every child at Dakota Spirit. 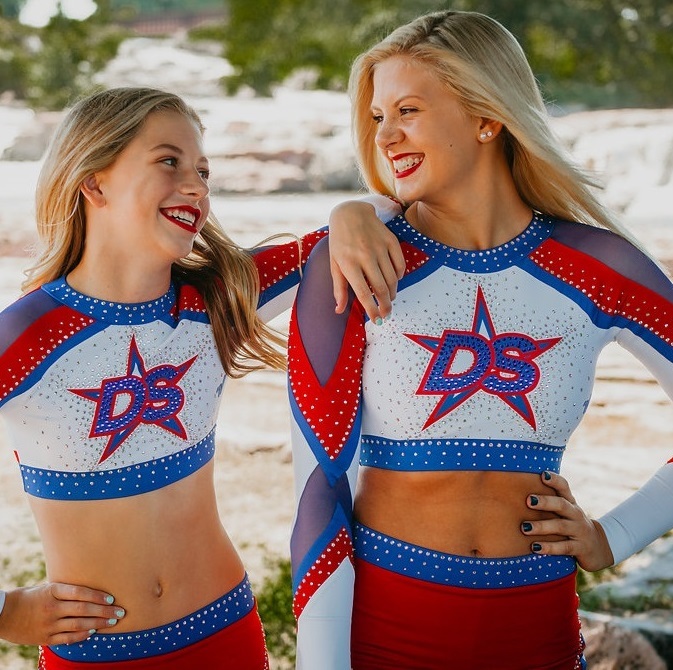 Our experienced staff and fully equipped facility at Dakota Spirit provide a safe place for your child to learn tumbling and cheerleading skills! Our performance teams are perfect for kids who love the limelight! These low cost and commitment teams are the perfect way for your child to find the spotlight without the demands of competing. Our prep teams are perfect for the athlete that loves cheerleading and is ready to compete! Dakota Spirit prep teams practice once a week and compete and perform locally about 6 times per season! Ready for the next level? All Stars is a great fit for the athletes that love to cheer 24/7! Many of our athletes that participate in All Stars go on to cheer at top Division 1 schools across the country! With a wide variety of classes offered, there’s a place for your little tumbler at Dakota Spirit! We offer classes from the beginner to the elite level! Our one month registration accommodates to busy families! Take a look at our tumbling classes offered this month! Looking to master a new skill? Need to improve your technique? Private lessons are a great way to work with your instructor one on one! Dakota Spirit offers a wide variety of summer camps and clinics within the school year! From tumbling to ninja warriors and preschool prep classes, we have the camps that will get your little one excited to move! TGIF! Every Friday night we have Friday Night Lights, which is our Open Gym! Come work tumbling and stunts! Or come play and dance with friends. Dakota Spirit customizes choreography and skills camps for your teams needs! After identifying your goal, we’ll work with your team or program to get to the next level!